RUSH: This is the essence of fake news, and this is exactly what the president was tweeting about today. There is nothing more infuriating than your enemy being right. And they can’t stand how right Trump is. Let me illustrate this for you. Here we are day two of the news media being just beside themselves, practically a PTSD over Trump’s summit with Kim Jong-un. Now, my friends — and I’ve talked about this often over the course of the many years of the Excellence in Broadcasting Network. That was the leading fear that people — we’re talking now back in the early nineties, whenever Laura Dern was 18, whenever that was. And of course it was the number one issue. When Reagan became president, the left became so anti-nuke. They’ve always been anti-nuke, but they just doubled and tripled down on it. Nuclear weapons were the absolute worst thing in the world. Nuclear weapons were gonna be the end of all of us. Getting rid of nuclear weapons was the key. When Reagan deployed missile bases in Europe, they were having cows. The point is, ladies and gentlemen, that it wasn’t that long ago in the big scheme things — and I am old enough to remember it — for those of you who aren’t, do not doubt me here — the media, the left, the Democrat Party used to think of denuclearization as the most important objective in the world. It was bigger than gay rights. It was bigger than LGBTQ rights. It was bigger than the fight against climate change. It was bigger than anything. We had the nuclear freeze movement. We had the global peace march. We had all of these things happening. The left was sponsoring die-ins. They would go to Washington, the steps of the State Department, the Pentagon, wherever, and they would pretend to enact the scenario when we had all been nuked, and they would lie down on the steps, and they would pour red paint on everything as though they were bleeding profusely. It was never ending. It was the number one leftist fear and leftist objective. And as recently as Barack Hussein O saying on an open Mike to Dmitry Medvedev, who was then the president of Russia sitting at the next hand to Vladimir Putin, Obama said, “Tell Vladimir I’ll have a lot more flexibility after I’m reelected.” This was shortly before the elections in 2012. He was talking about the United States getting rid of nuclear weapons. Obama had pledged to do that. So Obama gets elected and revives the number one fear. So as recently as 2012, it was a focal point of the Democrat Party, their president, and the media, getting rid of nukes. And it was bigger than any other issue. The mass demonstrators for a nuclear freeze. Even Amy Carter handcuffing herself to the White House fence to protest nuclear proliferation. And now the very same people and the very same Democrats are blasting Donald Trump for getting Kim Jong-un to a negotiating table and to promise in writing that he’s gonna get rid of his nuclear weapons. And they are hoping and praying for this to fail, and they’re making it sound like Trump is a dangerous fool and an idiot, that Kim Jong-un got the best of Trump. Now, this illustrates something that’s very important to point out. Had Obama done this very same thing, they would be cheering, they would be applauding, they would be scheduling honor ceremonies. And so what does it boil down to? It’s really not the substance of anything… Well, I can’t say that because in most cases, it’s not the substance of things that is causing the left to have its conniptions. While this is going on, they’re accusing us of hypocrisy. You know, a lot of people were saying, “You know what? If Obama had done in the last 24 hours what Trump has done, a bunch of Republicans would be demanding that he be impeached.” Well, that’s actually not true, because Obama has done what Trump did. But there’s a very salient difference, and it’s in the objective. When Obama got together with the Iranians, it was to help them nuke up. It was to spread, in fact, and add to the number of nuclear nations in the world. Obama believed the United States had no right to tell any other nation whether it could or could not nuke up because we didn’t have the moral authority. Who were we? We weren’t anything special, and we… The fact that we thought of ourselves that way needed to change — and back home he was in the process of, indeed, dialing us back. Trump getting together with Kim Jong-un is about getting rid of nuclear weapons in the hands of an insane, lunatic madman. The objective is entirely different. Obama was doing what Trump did, except with a little minor difference, and no Republicans were demanding Obama be impeached. But you can’t ignore the different objectives here. Obama was actually helping — by the way, not just the Iranians. Look at Obama trying to have normalized relations with dictators and political tyrants and thugs in Cuba, and look at all of the effort Obama made into harming our ally Israel. And during none of this were anybody shouting “Impeachment! Impeachment!” as the claim goes. But, you see, in each of these examples I’ve given you, the substance doesn’t matter. Because if Obama had done exactly what Trump did here — if Obama had had the last 24 hours — you and I would be so sick of watching them praise him, fall all over themselves, kissing this and kissing that and demanding to make Obama a saint and all this. Very same stuff. If Obama had done exactly, identically the same thing Trump has done, he would be loved, adored, honored, appreciated. Trump on the other hand becomes a bigger target for destruction. So why? Well, the question answers itself but in specific terms. What Trump is doing is two things. Well, there’s a third thing. Trump is making America great again. But he’s dismantling the Obama legacy step by step by step. That has ’em bugged. But there’s something else that Trump is doing, and this is something that you’ll never hear them say or discuss. Trump is illustrating that Obama was no great brain, that Obama did not have any superior intelligence or competence or ability, because all of the things Trump’s doing basically are unraveling the Obama administration for what purpose and objective? To make America great again. So we’re down here to, “Okay, well, what then causes all of this partnership?” If it isn’t the substance — because, again, Obama had had these last 24 hours, believe me, you and I would have been sick of watching the media celebrate it and all that by now. So it’s down to what? It’s down to personality. It’s down to… Whatever it is, it’s not the substance of the issue. Because I’m here to… Folks, I’m not exaggerating at all. Getting rid of nuclear weapons has been one of the hallmarks of liberalism, and for the longest time, it was a defining element. You had to be anti-nuke if you were going to be permitted to be a ranking member of the political left and the Democrat Party. If you weren’t, you were gonna be ostracized. In fact, do you remember how the media cheered when Obama said he was gonna cut our nuclear arsenal to the bone? The media loved it, they supported it, they thought it was great. Not our enemies. Obama was going to downsize our own arsenal, regardless what our enemies did. And you know why? You remember why Obama said he was gonna do that? Obama said — and you can go look this up if you doubt me. Obama said that he thought he would be leading by example, that if we publicly downsized our nuclear arsenal, that the bad guys of the world would follow suit, after seeing that we no longer represent a threat. Yeah, the Reagan days, the George Bush and the George W. Bush days and all the days before that, America was sunny as the problem in the world. America was seen as “The Great Satan,” the great threat — and so Obama came along realizing this, and all he thought he had to do was show that we’re not the Reagan America anymore and we’re not the Bush America. And to demonstrate that, I’m gonna downsize our nukes. And he believed stupidly, ignorantly, naively because he had zilch experience with the people he’s dealing with, that they would follow suit. He thought downsizing our nukes would make the Norks and the Iranians and the Russians give up or lessen the intensity of their own weapons programs. I kid you not. I just hope Google hasn’t airbrushed that out of the search history. Oh, yeah, that anti-nuke march in Germany, half million. Of course. Yeah. I’m telling you, it was every bit as big as climate change is today. So here we are on the verge of maybe denuking a bad-guy nation, and what? They’re hoping the opposite happens. They’re hoping this guy doesn’t get rid of his nukes so as to embarrass, belittle, and ultimately beat Trump. Utterly predictable, by the way. Utterly. 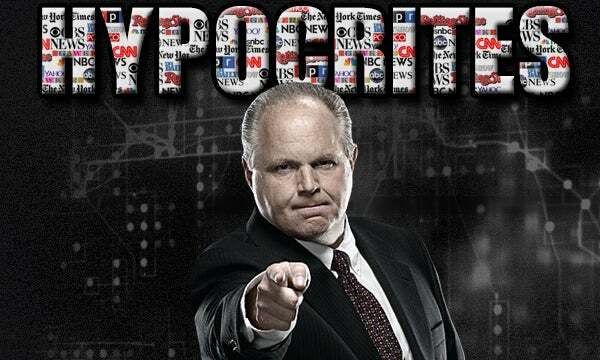 RUSH: Okay, I want to go back and reestablish my point about how big anti-nuke was to the left and the Democrats. 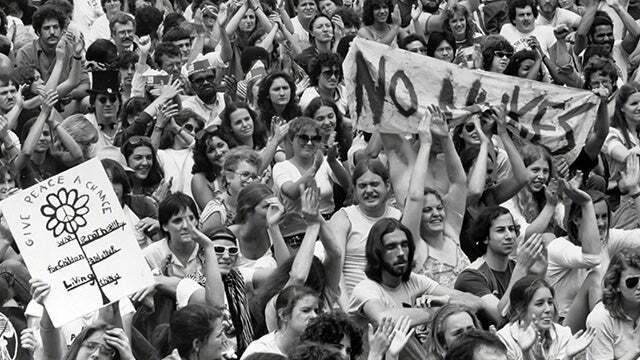 I’ve got another photo here, 1982, June the 12th, almost one million people protest nuclear arms race in New York City. This is during the Reagan administration. One million people. I’ve got the photo here. It’s a black and white photo. I’m not gonna bother putting it on the Dittocam. And here’s Obama, Barack Hussein O, as recently as May 27th, 2016. Listen to this. OBAMA: Among those nations like my own that hold nuclear stockpiles, we must have the courage to escape the logic of fear and pursue a world without them. We may not realize this goal in my lifetime, but persistent effort can roll back the possibility of catastrophe. We can chart a course that leads to the destruction of these stockpiles. We can stop the spread to new nations and secure deadly materials from fanatics. RUSH: How? He didn’t make one effort to do it. Now, Obama was in Hiroshima. And every year — when I was in Sacramento, the mayor out there, what was her name, Anne — oh, don’t fail me now memory. What was her name, Anne, Anne. Rudin, Anne Rudin. Every year, big press conference, “We need to apologize to the Japanese.” And she wanted to go over there and apologize to the Japanese. Every year on the anniversary date of Hiroshima, Nagasaki, the left would have these massive ceremonies, “We’re so sorry. We didn’t mean it.” But of course we did mean to do it, and it won and ended a war. My only point here is that these people have been on this anti-nuke crusade for 35 or 40 years as the dominant issue, as big if not bigger than climate change. And as recently as two years ago — this sound bite of Obama’s is classic. “Among those nations like my own that hold stockpiles, we must have the courage to pursue a world without them. We may not realize this goal in my lifetime.” Well, we’re gonna get a lot closer to it with Trump than we did with you. And the same people that were celebrating you and applauding you are trying to destroy Donald Trump for doing something they’ve wanted to happen for 35 years. It takes reasonable intelligent people like me to analyze this and keep it all sane so that you can understand it. ‘Cause it’s insane. Let me grab a call so that we can say we did it in the first hour of the program. Boise, Idaho. This is Tony. I’m glad you called, sir. What’s up? CALLER: Hey, Mr. Limbaugh. Great to talk to you. Hey, you’ve been talking a lot about how the media doesn’t get the Trump voter, they don’t understand why we do what we do. But I think there’s another thing, and I think these recent polls just indicate that, that the depth, the depth that patriotism and love for this country is deeper than these people realize as well. Because all you have to do is look at how quickly things have escalated to the point they are. Look where we’d be under Hillary or a continuation of Obama. And I think that not only scares the hell out of people, but it makes them thankful every day we have somebody like Donald Trump fighting for this country. Harvard did a survey in which they learned that the Fourth of July holiday featuring the flag tended to make people feel and vote more Republican! The simple fact of the matter is that the left looks down on outward expressions of patriotism. They think that it’s banal. They think it’s beneath them. Of course we live in America. What is nationalism? That’s really bad. I don’t need to prove my patriotism. But people who do, flags in the front yard, Fourth of July, or flags on the back of the pickup, they mock ’em, they make fun of ’em. And that’s why they’re never gonna understand the Trump voter. When you get down to it, they don’t even really want to.